This is a tuffy shelf computer desk made by the H. Wilson company. It is constructed from an engineered thermoplastic resin, injection molded, that will not chip, warp, crack, rust or peel. There are 2 steel reinforcements molded into the thick top shelf for extra strength. All tuffy shelves have a safety retaining lip and a raised texture surface that enhances product placement and ensures minimal sliding. Electrical attachment is recessed to insure passage through most standard doorways and other tight spots. 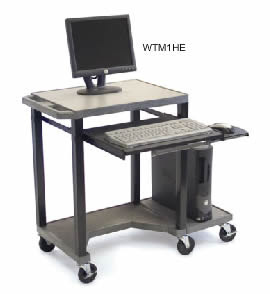 The H. Wilson company, founded in 1959 by a visionary named Howard Wilson, is the premier manufacturer of utility carts, mobile cabinets, audio visual carts, video tables, computer work stations, overhead projector tables, TV and speaker mounting systems, literature racks, tripods and more. It all started back in the 1950's when Howard was working for Radiant Screen Company in Chicago as the Regional Sales Manager. Howard had a particular affinity for the audio-visual portion of his responsibilities and marketing efforts of Radiant Screen. When he decided to open his own business, he knew it would be in the AV market. Howard looked for a product for which there was a need but not presently being made and supplied. In 1959, before he introduced his Rear Projection Unit, Howard founded H. Wilson and built a modest dealer base selling projector tables. The projector tables were all he sold until July of 1960, when at the NAVA convention he publicly introduced his Rear Projection Unit. By this time, Howard had a solid nucleus of dealers working with him. The Rear Projection Unit was eagerly accepted by the educational market and ultimately went on the be the first in a long line of H. Wilson's very successful products. in October of 1976. While H. Wilson is strongly identified with plastic manufacturing technologies, their steel manufacturing capabilities are second to none. Howard's greatest achievement came in the early 1970's when H. Wilson was the first company to successfully apply the emerging technology of structural foam injection molding as an alternative for manufacturing steel mobile carts. Structural foam is nearly indestructible, and it made shipping disassembled products practical and cost-effective. H. Wilson serves world markets through leading audio-visual dealers, microcomputer dealers, school equipment distributors, library equipment distributors, office products dealers and other specialty furniture channels of distribution.